1983 1983 本人 (声) エピソード: "Urban Chipmunk"
1999 本人 (声) "Sunday, Cruddy Sunday"
^ "Dolly Parton to release new album, Blue Smoke, in the US on May 13, 2014" Archived 2014年4月21日, at the Wayback Machine., websterpr.com; accessed May 10, 2014. ^ Jensen, Todd Aaron (2010-08-18). On Gratitude: Sheryl Crow, Jeff Bridges, Alicia Keys, Daryl Hall, Ray Bradbury, Anna Kendrick, B.B. King, Elmore Leonard, Deepak Chopra, and 42 More Celebrities Share What They're Most Thankful For. Adams Media. p. 163. ISBN 1-4405-0893-3. https://books.google.com/books?id=RM58oSA6jSsC&pg=PA163 2014年7月15日閲覧。. ^ Magill, Frank Northen; Aves, Alison (1999). Dictionary of World Biography. Routledge. p. 2896. ISBN 978-1-57958-048-3. https://books.google.com/books?id=uiQAaGgOChIC&pg=PA2896 2014年7月14日閲覧。. 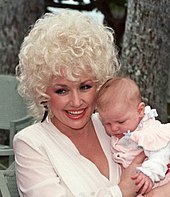 ^ Parton, Dolly (1996-05-01). Dolly: My Life and Other Unfinished Business. Thorndike Press. p. 214. ISBN 978-0-7862-0364-2. https://books.google.com/books?id=EXtOewAACAAJ 2012年12月13日閲覧。. ^ Orloff, Brian (2008-03-17). “Dolly Parton Calls Miley Cyrus a 'Little Elvis'”. People. http://www.people.com/people/article/0,,20184725,00.html 2012年2月12日閲覧。. ^ “"Dolly Parton Reflects on Her Greatest Moments"”. 2007年10月12日時点のオリジナルよりアーカイブ。2014年3月22日閲覧。 , cmt.com; July 7, 2006. ^ Press release (April 16, 2001). "June 14, 2001 @ Sheraton New York Hotel & Towers, Imperial Ballroom"[リンク切れ]. Songwriters Hall of Fame; retrieved February 12, 2012. ^ Jones, Kenneth (2008-07-15). “Hello, Dolly! 9 to 5 Books Broadway's Marquis; Full Casting Announced”. Playbill. オリジナルの2009年5月6日時点によるアーカイブ。. https://web.archive.org/web/20090506095050/http://www.playbill.com/news/article/119466.html 2012年2月12日閲覧。. ^ Designing Women Season 4 Episode Guide Archived 2009年6月25日, at the Wayback Machine. ; airdate: January 1, 1990. ^ Ybarra, David (December 2009). “Dolly Parton Interview”. Daeida Magazine: 26. http://www.daeida.com/DAEIDA_2010_Archive_Holiday2009.html. ^ Parton, Dolly (2006). Dolly's Dixie Fixin's: Love, Laughter, and Lots of Good Food from My Tennessee Mountain Kitchen. Viking Studio. ISBN 978-0-670-03814-5. https://books.google.com/books?id=bSToAgAACAAJ 2012年12月13日閲覧。. ^ "Emmylou Harris and Dillinger Escape Plan bassist Liam Wilson support PETA Archived 2006年2月11日, at the Wayback Machine.," AdPunch, January 24, 2006. ^ “Dolly Parton, American Eagle Foundation and Bald Eagle "Challenger" Help Open New Bald Eagle Refuge Exhibit at Smithsonian's National Zoo”. American Eagle Foundation. (2003年7月2日). オリジナルの2014年7月14日時点によるアーカイブ。. 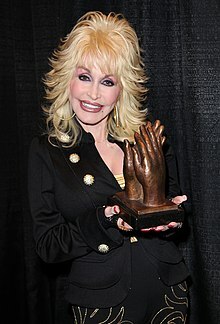 https://web.archive.org/web/20140714221202/http://www.eagles.org/news/Articles/Dolly-Parton-AEF-Challenger-Help-Open-Exhibit.php 2014年7月14日閲覧. "Ms. Parton was given the U.S. Fish & Wildlife Service "Partnership Award" in recognition of her outstanding support for Bald Eagle conservation and the National Wildlife Refuge System." Miller, Stephen (2008). Smart Blonde – Dolly Parton. Music Sales Group. ISBN 978-0-85712-007-6. https://books.google.com/books?id=hZrxRDPPQ48C. "Dolly Parton: The Real Queen Of All Media". Reporter: Morley Safer. 60 Minutes. CBS. 2009年6月7日放送.